Throughout the 80s the public domain corner of gaming presented a wealth of creativity and bizarre ideas . ‘Super Blackjack Battle 2 Turbo Edition - The Card Warriors’ is reminiscent of those times; a quirky idea made by a small team on presumably a tiny budget. However, while it may be a Fun idea in theory, the melding of classic 2D fighter with a card game really doesn’t work in practice. There’s no doubt Stage Clear Studios know ‘Street Fighter 2’. The title ‘Super Blackjack Battle 2: Turbo Edition - The Card Warriors’ alone reflects an intimate knowledge of gaming’s most famous fighting series, parodying Capcom’s love of adjectives. But the infatuation doesn’t stop with the overly protracted game name, the visuals, sound effects, music and characters all are loving tributes. “With its 80's retro style and sassy character interactions [its] perfect for players wanting to get their share of nostalgia!” Stage Clear Studios boast. The game’s opening serves as a clear indication of whats to come. 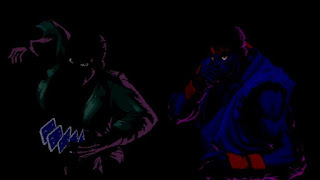 A heavily pixelated version of Mark, the main protagonist in ‘Super Blackjack Battle 2 Turbo’ menacingly bobs in the darkness, illuminated by blue flashes of lightning. However, unlike Ryu’s identical appearance in the opening of ‘Super Street Fighter 2’ he isn’t charging up a fireball, he’s shuffling cards. As the chiptune music builds to a crescendo, Mark scatters the cards towards the player as a bombastic announcer screams the game’s Title. It’s all done beautifully and any fan would be hard pushed not to grin at the homage. Sadly, like the entire game, it just emphasises why no one has mixed black jack with ‘street fighter’ before; it simply doesn’t make sense. From a practical point of view why would a card-shark risk getting his cards wet in the rain, and if he is so adapt at shuffling why would he drop them at the end of the intro? 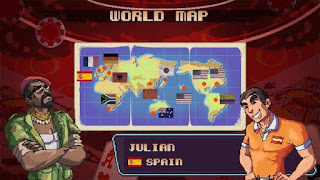 This “Undercover FBI agent” is one of ten playable ‘Card Warriors’ and, like his contemporaries, he is an obvious stereotype that borders on causal racism. If he isn’t your cup of tea don’t worry, you can pick a Colombian cartel leader, a Japanese School Girl, a German Warmonger, or a miserable Baret wearing French Man. The choice has no consequence beyond an aesthetic change, they all play identically, both when your avatar and when you’re fighting against them. 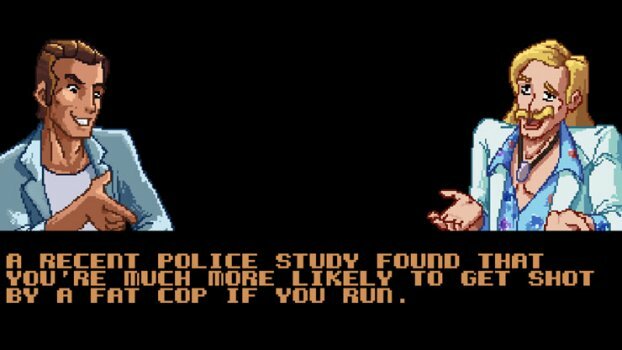 The main story mode of the game is structured identically to ‘Street Fighter 2’. 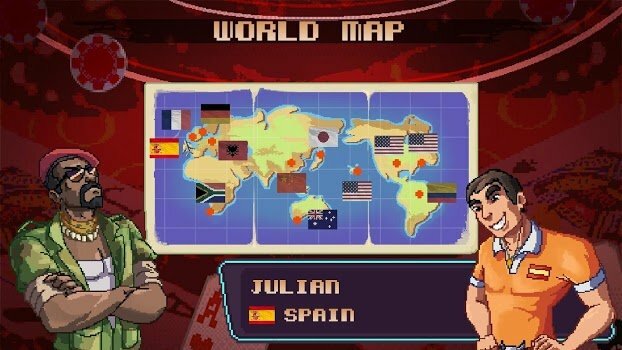 After character selection you travel the world battling opponents in their home country. Instead of fisticuffs, both of you sit down at a black jack table and dual with cards. 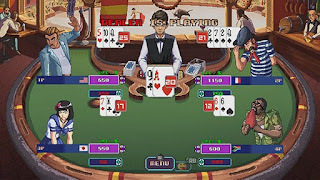 You have ten rounds to obtain more money than your opponent and this is done by winning hands. To do this you must take cards with the aim of getting a total closer to 21 than the dealer. Exceeding a card total of 21 means you instantly lose. If you win you double your bet, losing means the loss of your stake. Even the most novice of card player will notice the obvious flaw here. Unlike poker, or even snap, black jack isn’t a competitive game. A player aims to beat the house, but it’s irrelevant who else is at the table as players don’t interact with one and other. While there is some element of skill knowing when to hit and when to hold, short games are predominantly down to luck. There’s no chance to count cards here, but all the other elements of traditional black jack are included. You can double down and buy insurance for example. Your fellow player, regardless of who they are, all behave in a reckless and inhuman manner. They will bet random amounts, take illogical chances and will either win spectacularly or lose before the ten rounds are over. The dealer, who you really only need to beat, plays a much more conservative game; following pretty standard house rules. He won’t draw after hitting a 16 hand for example. To beat anyone, the majority of time all you need to do is play equally conservatively. I once completed the game, never betting more than the minimum $50 stake, and never hitting once I reached a 17 hand total. It was an incredibly dull way to play, I made no in-game money but it did prove how the central game’s combat mechanics simply don’t work. Black Jack is fun when you’re balancing risk against reward. When all you have to do is have a bigger cash pot after ten rounds there’s no incentive to take risks. In the main game Your cash total doesn’t carry over from one fight to the next, so as long as you have more than your opponent it doesn’t matter if you have $800 or $4000 at the end of the match. Beating the ten opponents is therefore not really a challenge. If the cards favour them you simply need to retry the match till they don’t. 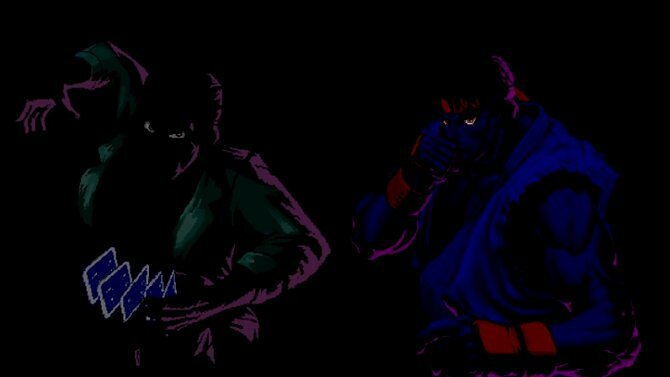 Given the game is inspired by ‘Street Fighter 2’ I had expected each character to have special moves that activates when they have black jack, double down, or perhaps when they draw five cards in a hand. Sadly there’s nothing like that in ‘Super Blackjack Battle 2 Turbo Edition - The Card Warriors’. Once you’ve played one hand in the story mode you’ve experienced the entire main game. There are other modes, including a solo endless mode where you keep going till you get bored. The only reason to play this is to unlock an additional playable character but as he plays identically to all the others that’s not that great a reward. Multiplayer, as always, is far more fun than battling a robotic AI. 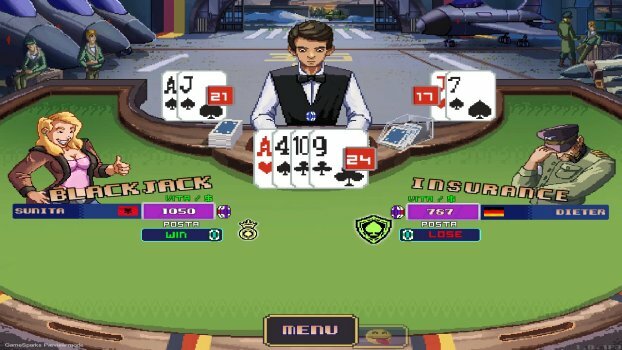 It does illustrate that ‘Super Blackjack Battle 2 Turbo Edition - The Card Warriors’ includes a comprehensive version of black jack. 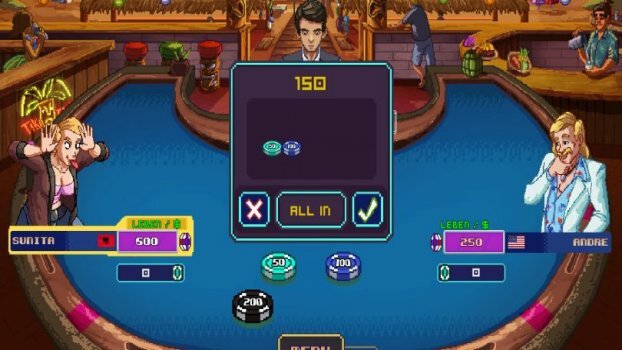 However when the main reason to play in real-life Vegas is to win money, is this really the card game you would want to play on your switch? Gambling video games always struggle with the inherent problem that you don’t actually win real world money, so there’s no life changing risk or tangible reward. More complex sophisticated card Games like poker, translate better when skill is involved but the random nature of black jack can frequently be more frustrating than fun. 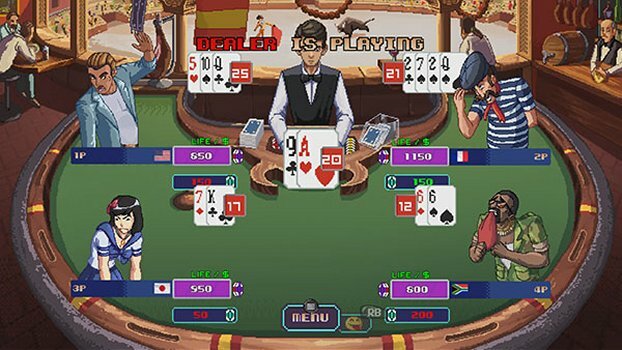 ‘Super Blackjack Battle 2 Turbo Edition - The Card Warriors’ is actually closer to games like the Amiga’s ‘Body Blows’, 'Clay Fighters' or the countless clones that crowded the 90’s release schedules. They look and sound the part, but lack the addictive gameplay, variety, subtlety and skill. 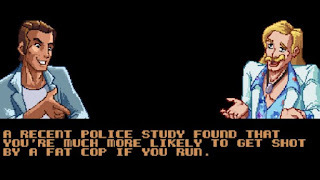 ‘Street Fighter 2’ wasn’t beloved because it had dialogue between fights and detailed rich environments. These may be replicated in ‘Super Blackjack Battle 2’ but their inclusion doesn’t make the game as fantastic as the inspiration. Dressing a competent, but dull, card simulation game in ‘Street Fighter 2’ clothes hasn’t made this a must buy, even if it’s frequently less than £1 on the eShop. It’s a funny five minute joke, but if you want either a competent casino title you’re going to be more amused looking elsewhere.